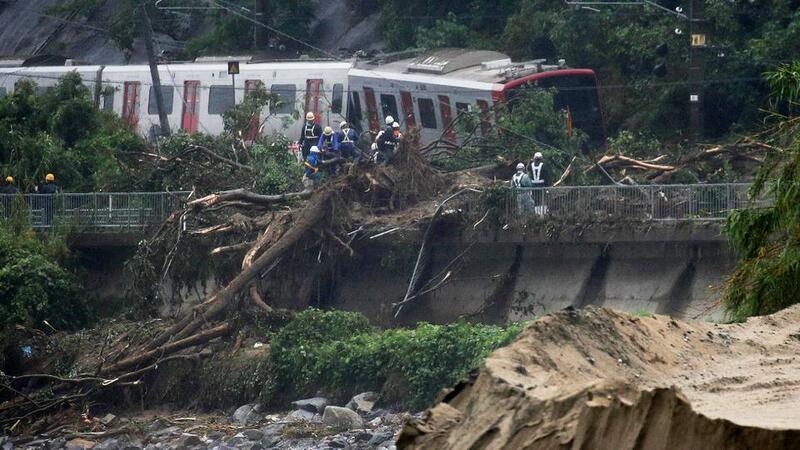 TOKYO, July 11 (Xinhua) -- The death toll in the wake of torrential rains battering western Japan and caused devastating floods and fatal landslides reached 176 on Wednesday, authorities said. They also said that 80 people still remain unaccounted for as search and rescue missions continue to try to find people still stranded in buildings cutoff from roads due to flooding, buried beneath rubble from landslides, or in swollen rivers. Thousands of people in the affected regions are still struggling without water supply, with the welfare ministry saying that 254,084 homes spanning the hardest-hit prefectures of Hiroshima, Ehime and Okayama are still without water. Across nine other prefectures including Osaka, Yamaguchi and Tokushima, the ministry said that 1,100 homes remain with no water supply and the likelihood of it being restored is extremely minimal. The Self-Defense Force (SDF) troops deployed to help the relief missions and local governments have been grappling to supply water to those who have been forced to evacuate. In western Japan, local municipalities have said that as of 10:30 a.m. there were more than 7,200 people taking shelter at emergency shelters across 15 prefectures. In the hardest-hit region of Okayama and Hiroshima Prefecture, there are 3,050 and 2,996 evacuees respectively staying in emergency facilities. Both emergency services, households and evacuees have struggled with telecommunications services as NTT West said that nearly 16,000 landlines and internet connections are down affecting an expansive area of western Japan. As a result many parts of the region have become connection "dead spots" for both land-based and mobile devices. The telecommunication firms with coverage in the devastated areas said that severe downpours damaged communication cables and other key infrastructure, severely handicapping their services.